The Wilton Manors Historical Society was originally formed in 1975. The Society was re-launched as an independent entity in 2002 following periods of activity and dormancy. On November 15, 2002, the State of Florida formally recognized us as an incorporated non-profit organization. Our Mission Statement starts off with the fact that we are "To collect, preserve and interpret Wilton Manors history and promote public awareness and appreciation for the rich past of the Island City." The link, above, will take you to the entire Mission Statement. In recent years, the Society has felt that it was not enough to "preserve and interpret" the past. We actively promote Wilton Manors as a current and vibrant city with “small town” charm. The Historical Society also maintains a focus on the future. We have an excellent working relationship with the City and try to provide both perspective and vision to help the City with initiatives to enhance the quality of life in Wilton Manors. Currently, we are leading the project to restore and repurpose the mid-1920’s Willingham Carriage House at Richardson Historic Park and Nature Preserve. 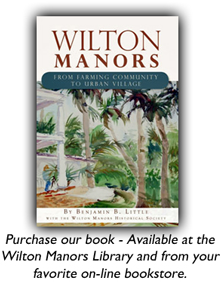 We have published a new history book, Wilton Manors: From Farming Community to Urban Village, which won the Stuart B. McIver Historian's Award from the Broward County Historical Commission in 2012. The Society is staffed entirely by volunteers who annually contribute hundreds of service hours in the pursuit of the above activities. We have a seven-member Board of Directors elected by the general membership and we are supported by membership dues, donations, program fees, fund raising events, and government and foundation funding. We meet usually meet in the City Hall Commission Chambers on the third Thursday of the month (except July and August) at 7:00 p.m. Our Annual Meeting is held in January at the Richardson Historic Park Manor House. All are welcome to attend.